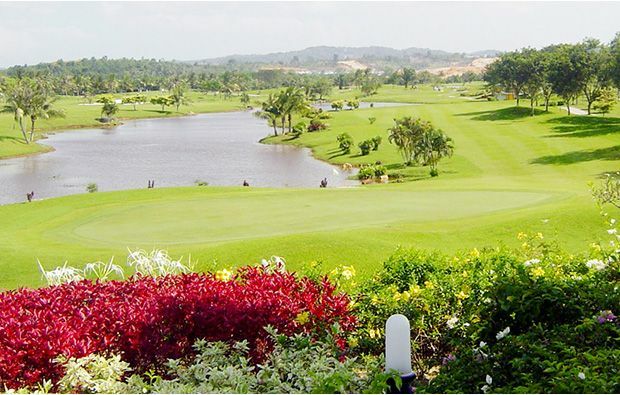 Very challenging opening hole which is a par 5 with a blind tee shot over some mounds to the fairway beyond – the hole then zigzags downhill towards the green with well-placed bunkers lining the fairway. The second is an uphill par 4 with a large bunker protecting the tiger line and very narrow gap between the trees for your second to the green. 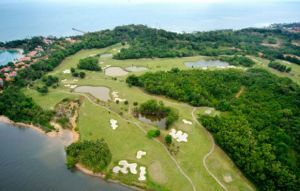 The 3rd is a downhill par 3 with great views over the sea from the elevated tee box – excellent birdie opportunity here. The 4th is another challenging dogleg, uphill par 4 with a blind approach to a narrow green. The 5th is a short downhill par 3 from a very elevated tee box – very easy to run off the green if you get club selection wrong. 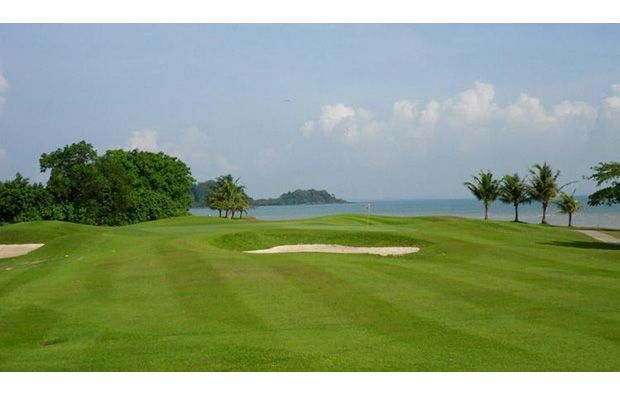 The 6th is another challenging par 4 which runs beside the sea with the green right on the water’s edge. High handicappers will find the 7th particularly challenging as you have to carry a water hazard off the green and then again for your second and also for the approach to the green. A bit of respite on the 8th as long as you can avoid the water running along the right of the fairway. 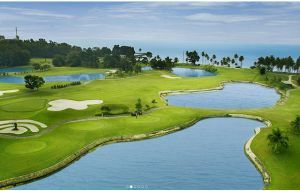 A long par 5 takes you back to the clubhouse as you tee off over the edge of the water hazard – if you get I the wrong position with your second then you can get blocked out by the trees short and left of the 9th green. You cross over the road for the first four holes of the back nine – the 10th is a dogleg par 4 with a very large bunker protecting he tiger line. The 11th is a great par 5 with a tee box right beside the sea offering a choice of fairways – go right and it’s a shorter route to the green but a narrower target – probably better to go left as less trouble and a better angle for the approach to a narrow green. The 12th offer a blind tee shot with a bunker complex ready to catch the pushed drive – get on the fairway then it’s a relatively simple approach uphill to the green. The 13th is a tricky uphill par 3 and you cannot see the narrow putting surface from the tee box. You cross back over the road to play the par 5, 14th which is a slight dogleg right and the main problem here is the water and large bunker protecting the right side of the green. The 15th if a short and quite easy par 3 and this is followed by an equally straightforward par 4. The 17th skirts the edge of the lake and it requires an accurate tee shot as you can either end up in the water hazard or run off the end of the fairway as it turns the corner. Big hitters can go straight across the hazard towards the green which sets them up for a great birdie opportunity. 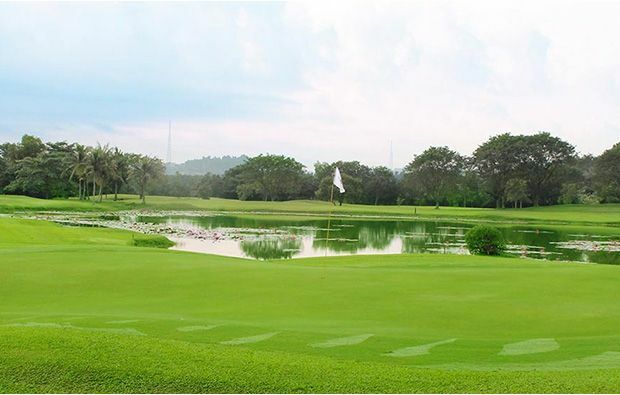 Tough finishing hole with water all along the right and a difficult tiered green. 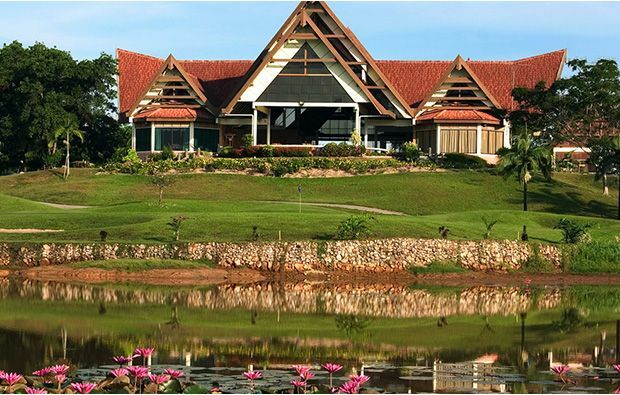 A very spacious clubhouse offering local cuisine and massage. Accommodation is available onsite if you wish to stay for the weekend. 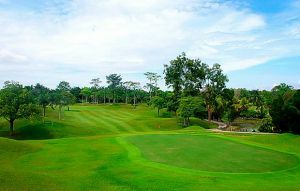 It could not be easier to secure a tee time at Indah Puri Golf Resort using the Golfsavers booking engine which can secure a tee time in seconds. 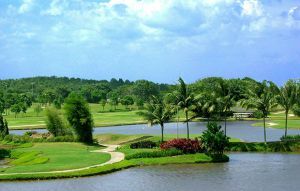 Indah Puri Golf Resort has different Services to offer. Choose a date and number or players to see the rates.